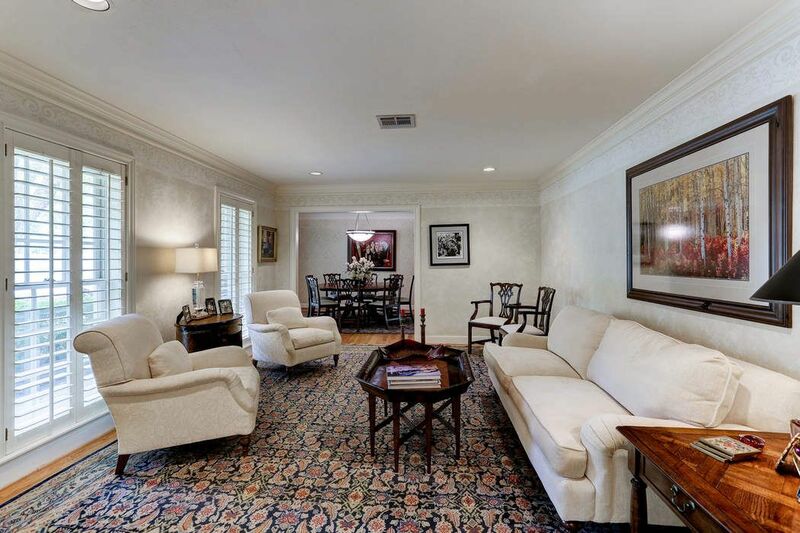 714 Brittmoore Road, Houston, TX 77079 | Martha Turner Sotheby's International Realty, Inc. The fenced in back yard is an oasis. There is so much to do here. 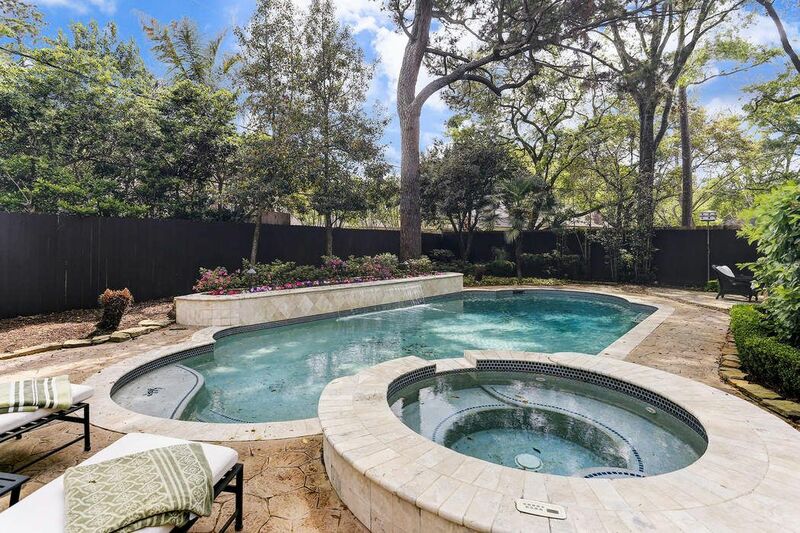 A large pool with water fall and hot tub; plenty of grassy area for play, a fire pit and lounging area. 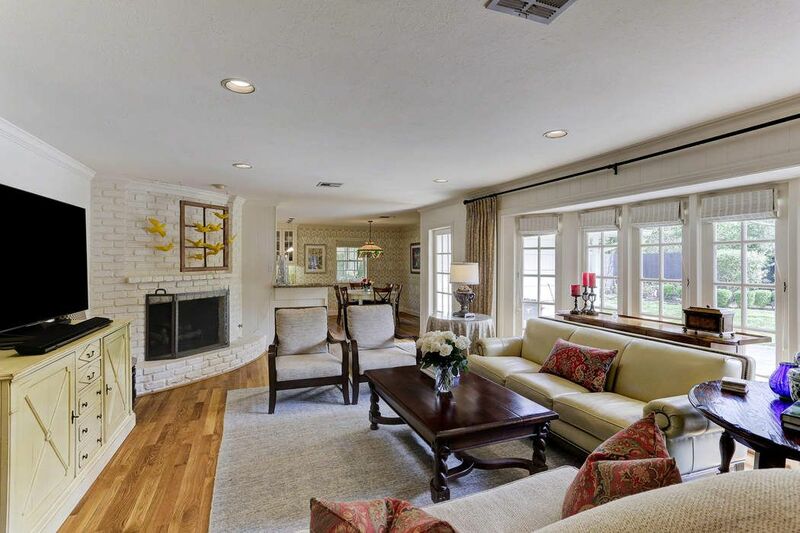 The Living Room is warm and inviting with a subtle color palate, wood floors and large windows with plantation shutters. This view is looking from the Living Room into the Dining Room. 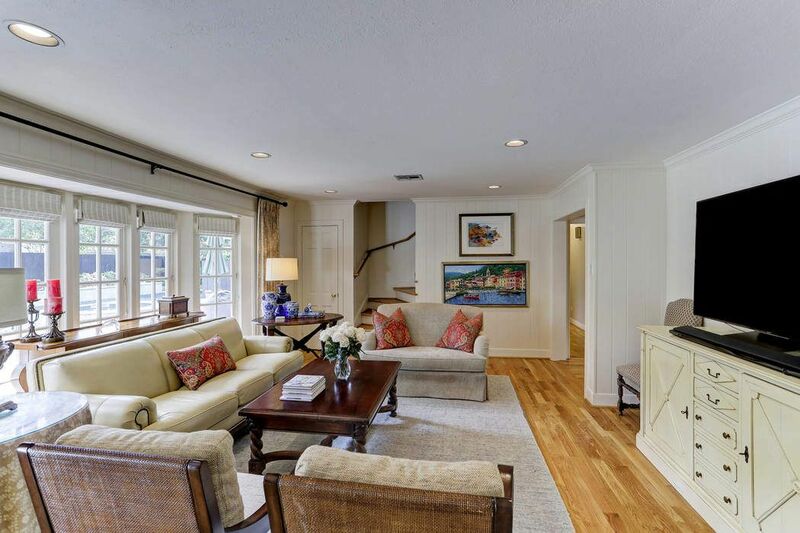 This view of the Family Room accents the great corner fireplace and good flow into the Breakfast Room and Kitchen. Wood floors provide easy maintenance. This remodeled Kitchen is sleek and functional. 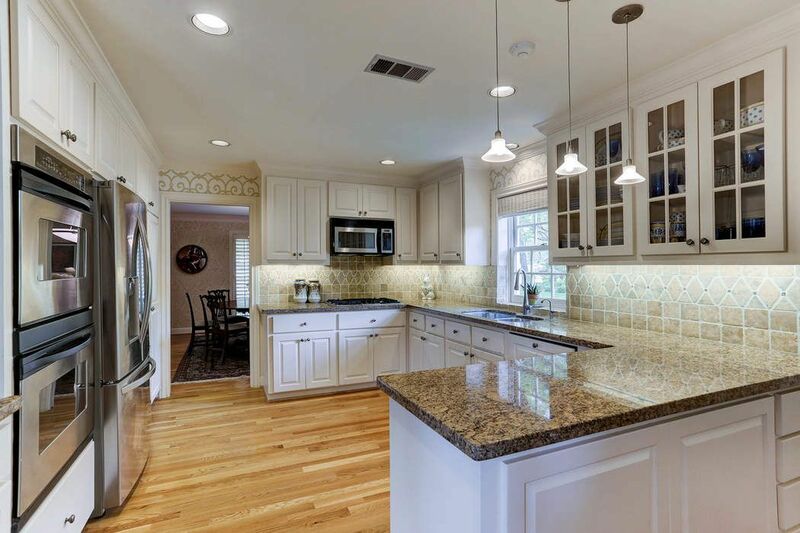 Highlights are wood floors, glass front cabinets, granite counters, double ovens (one convection) and a gas cook-top. 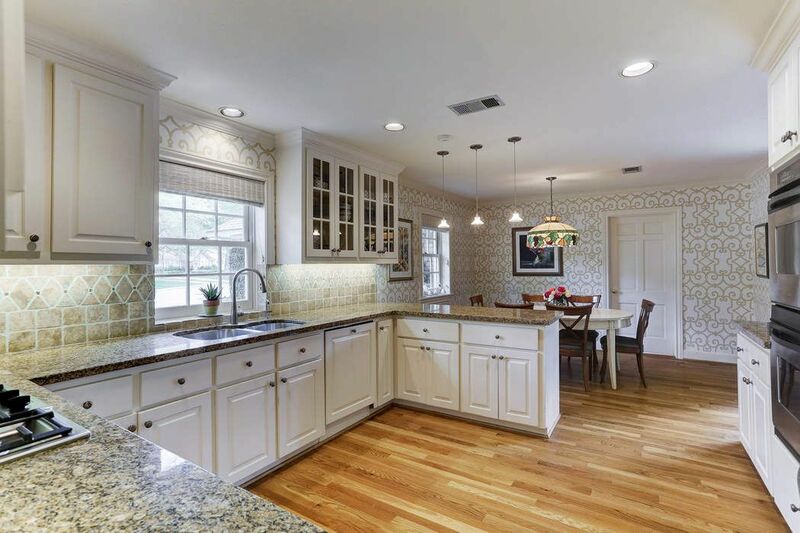 The Kitchen has very easy flow to both the Dining Room and the Family Room. 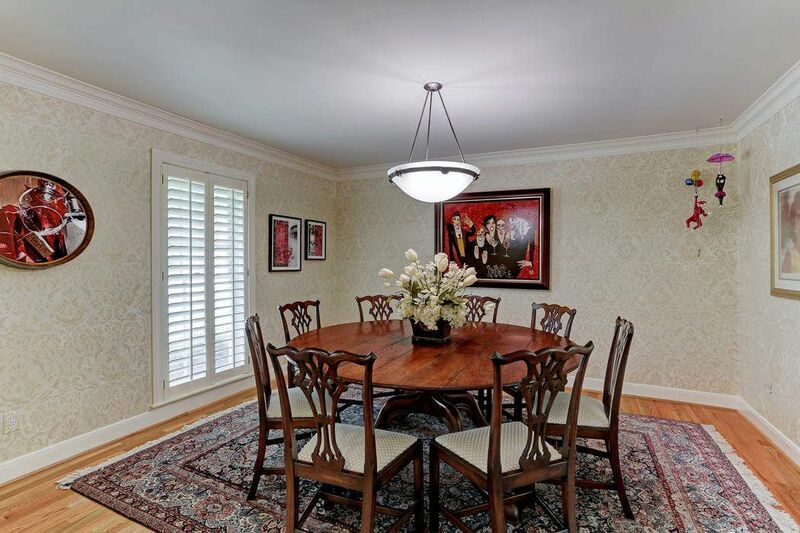 Breakfast Room - great gathering spot or perfect place to read the paper with a cup of coffee. Another view of the Kitchen looking into the Dining Room. 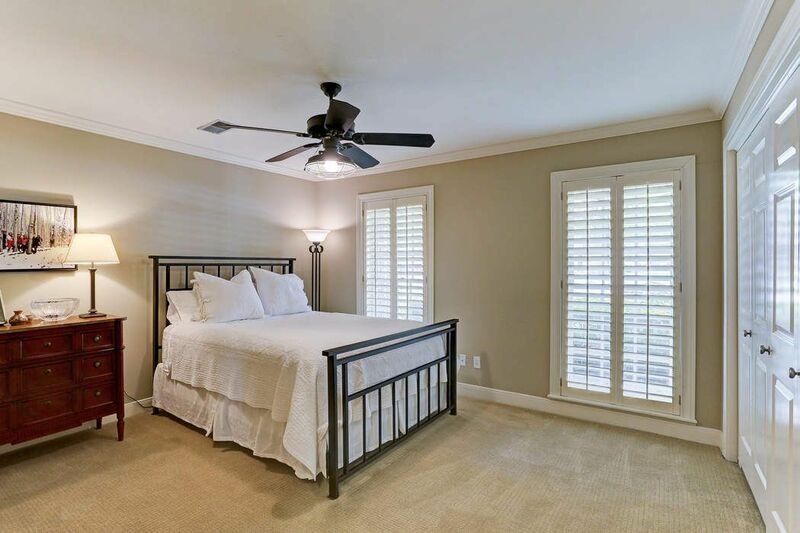 The Master Bedroom is a wonderful sanctuary at the end of the day with serene colors, natural light and a view of the putting green! 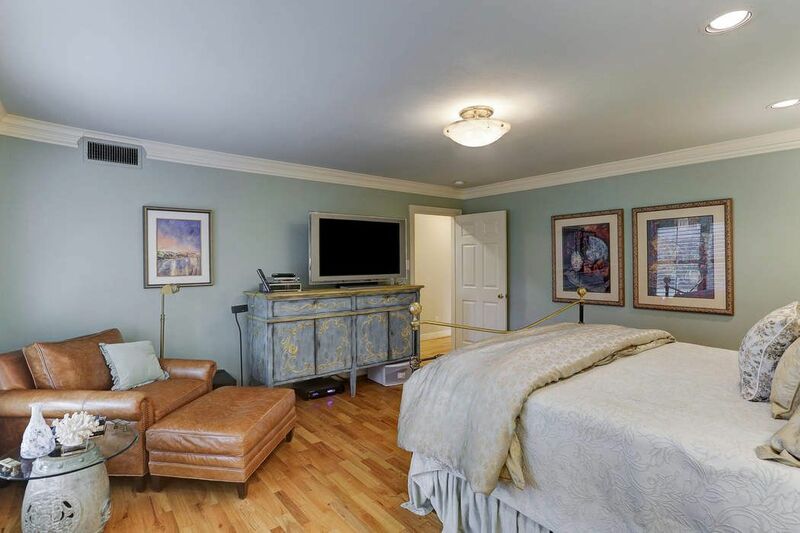 In this Master Bedroom view, you can see that there is plenty of room for sitting area and large entertainment center. 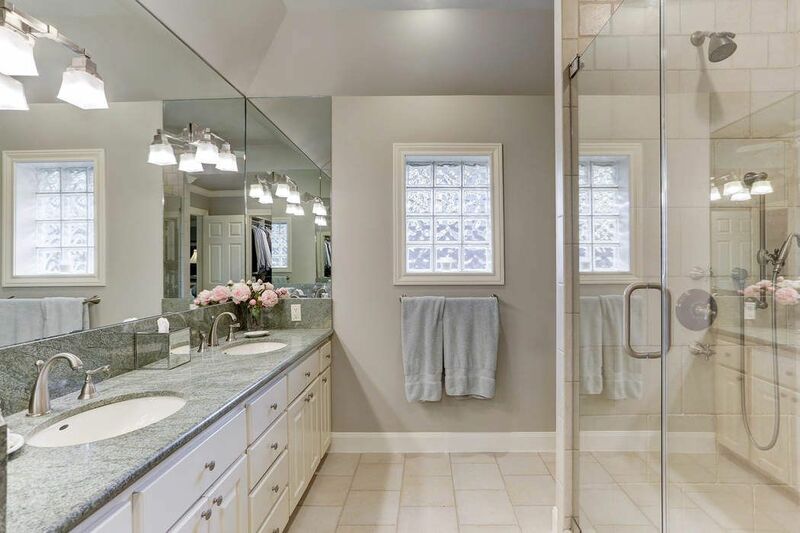 The en-suite Master Bath was remodeled and enlarged in 2005 with granite counters, a walk-in shower, polished nickel plumbing fixtures and custom lighting over the vanities. A Glass block window provides natural light. 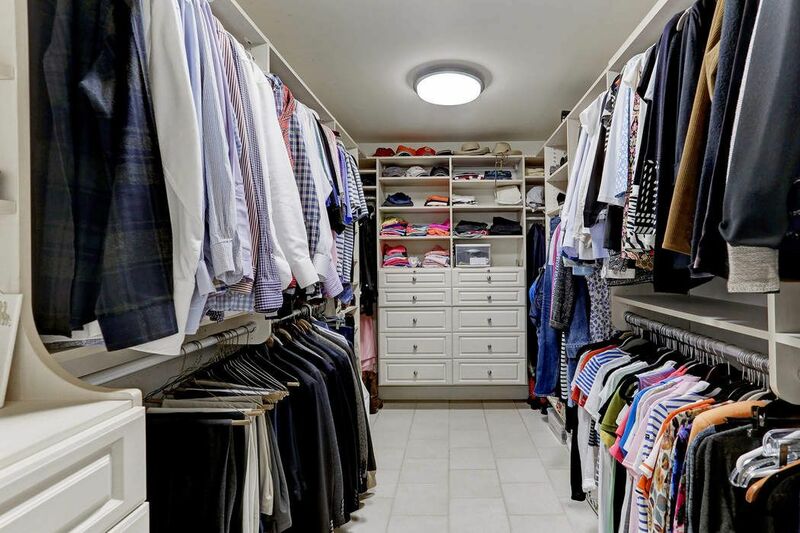 WOW - what a closet. 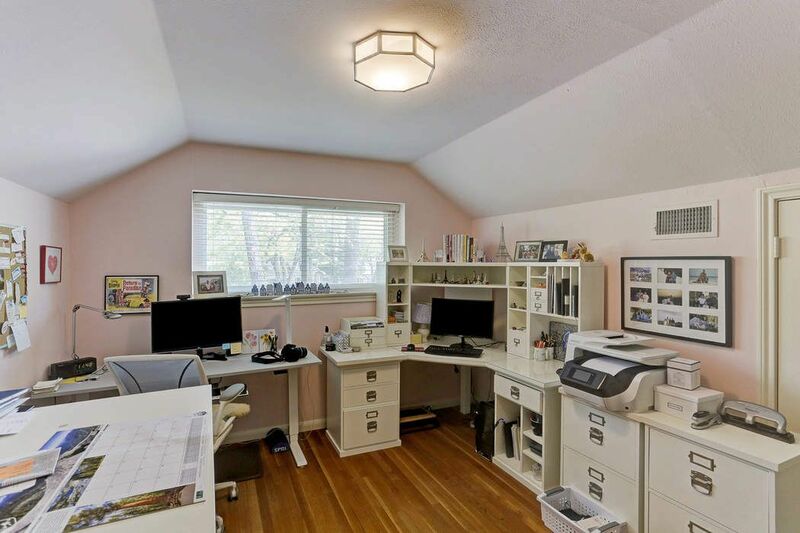 Lots of space with plenty of built-ins! One of 2 secondary bedrooms that are located on the First Floor. 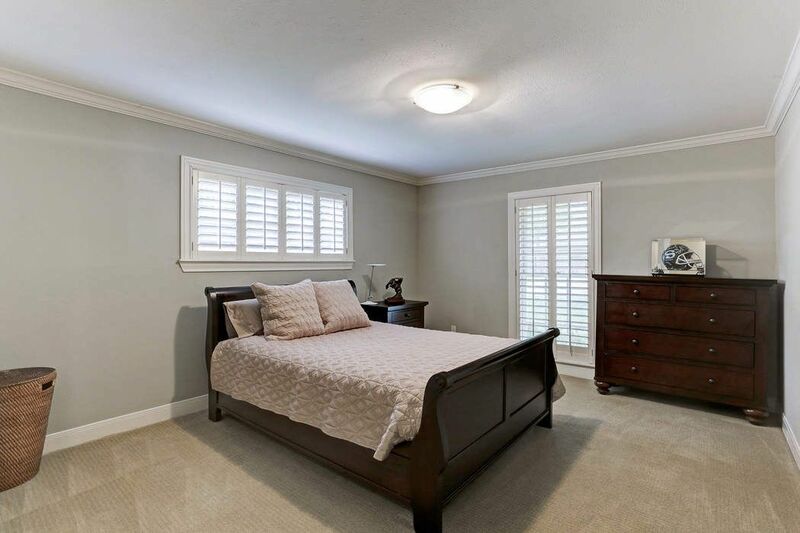 This bedroom has carpet, ceiling fan, large closet and plantation shutters. One of two secondary bedrooms located on the First Floor. 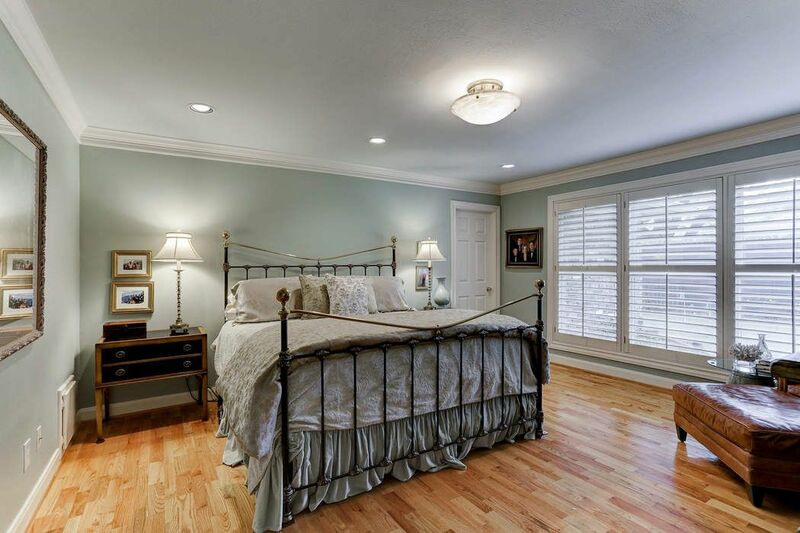 This room as carpet, crown molding, a large walk-in closet and plantation shutters. 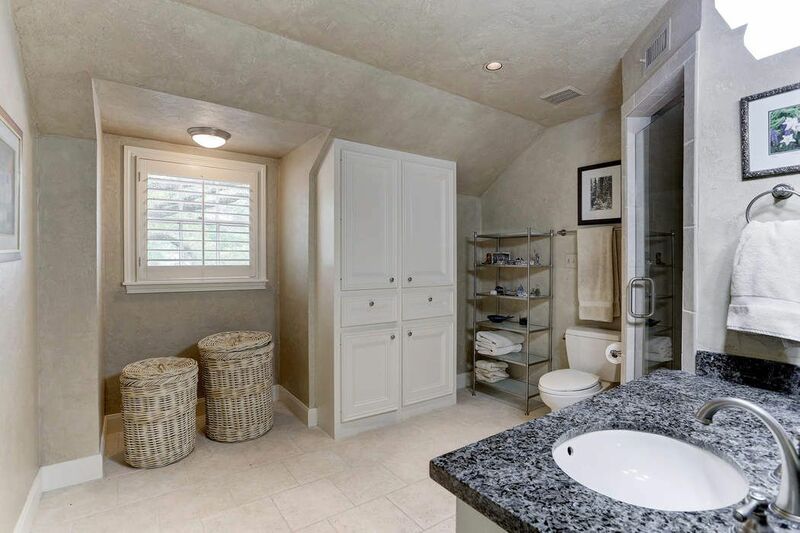 The First Floor full bath has been remodeled with a tub, walk-in shower, tile floors, granite counters and custom lighting. 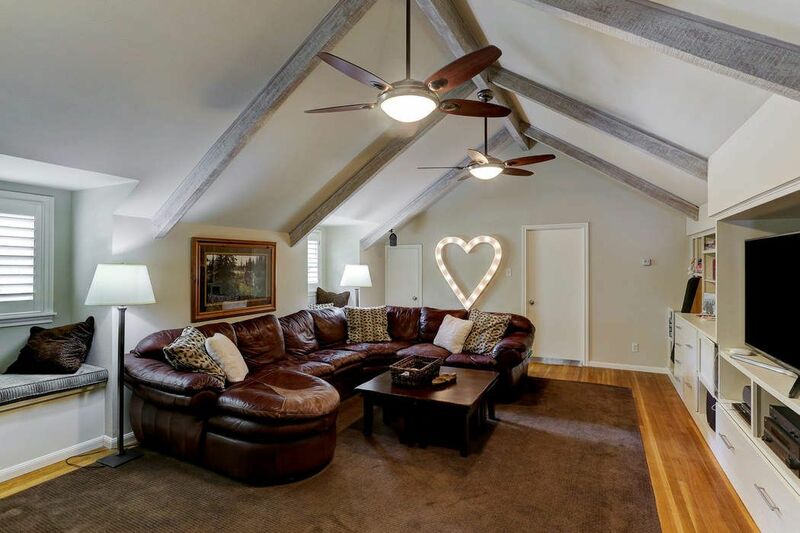 At the top of the stairs, you enter this very large Game Room with high, vaulted ceiling and stained beams. Extensive shelves and cabinets were added to this room in 2009. This game room is nestled between the two second floor bedrooms. This is one of 2 secondary bedrooms located on the Second Floor. This bedroom is currently being used as a office. There is one large closet and a very large attic area that can be used for storage. One of 2 secondary bedrooms located on the Second Floor. This one is currently being used as an office. 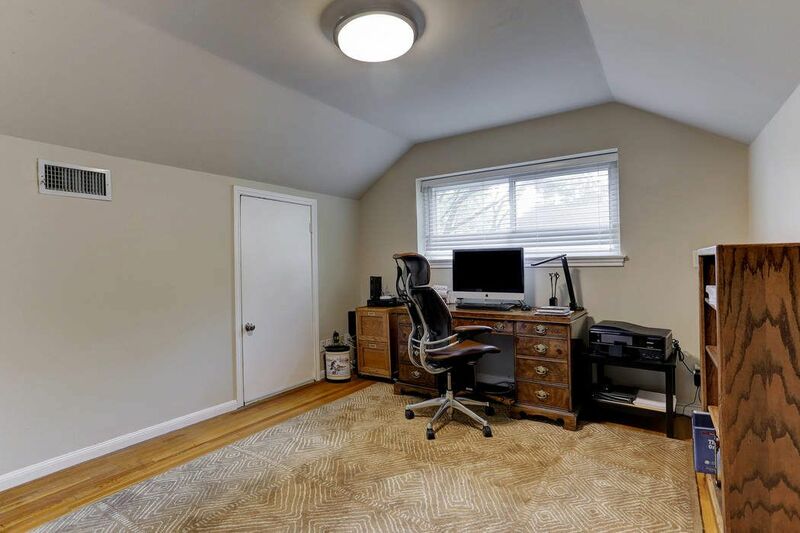 This room has a very large walk-in closet along with 2 large attic spaces that can be used for storage. 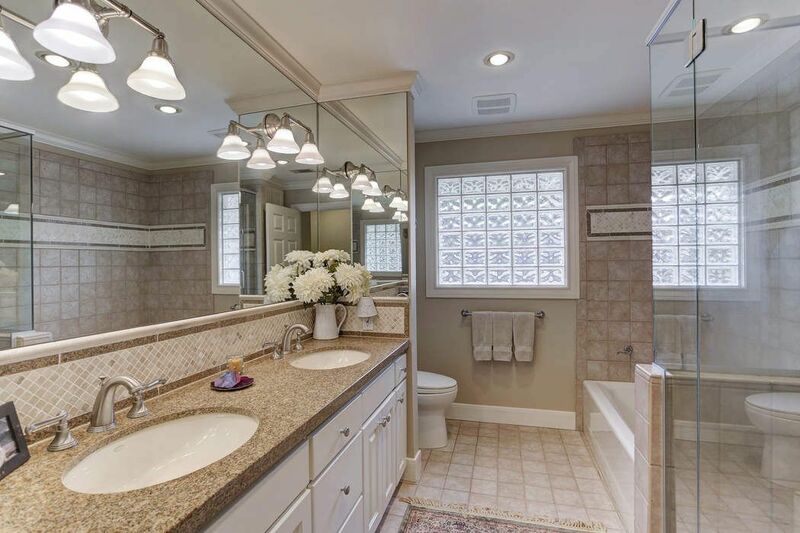 This full bath on the Second Floor was remodeled with tile floors, granite counters, a walk-in shower and built-in storage. 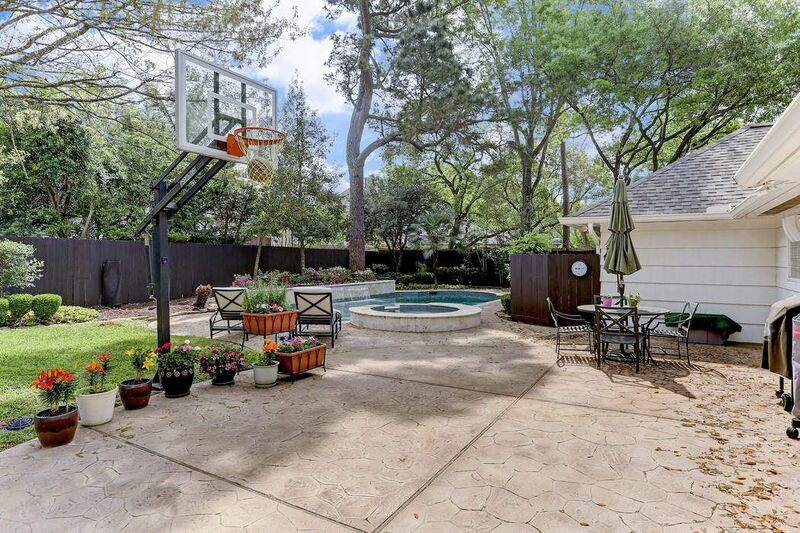 Another view of the over sized back yard with pool, grassy area and basketball hoop. You can have tons of fun in this yard! 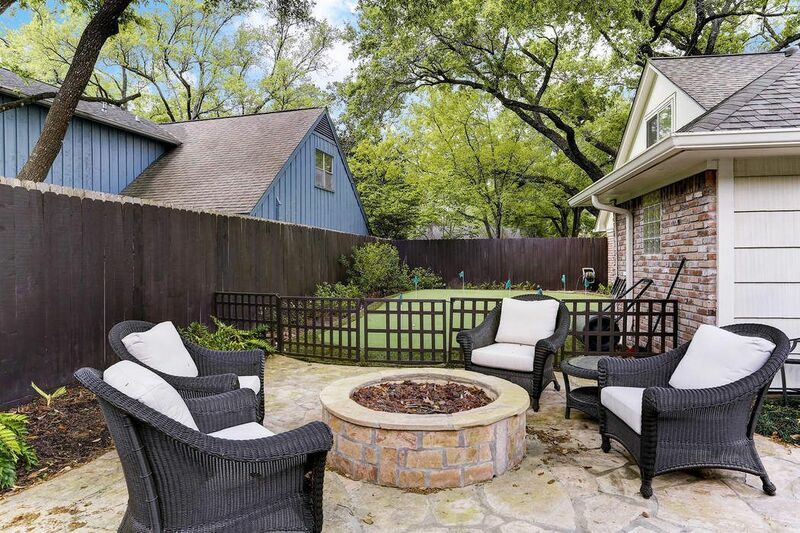 Spend lots of time out here either putting on the green or relaxing by the fire pit. 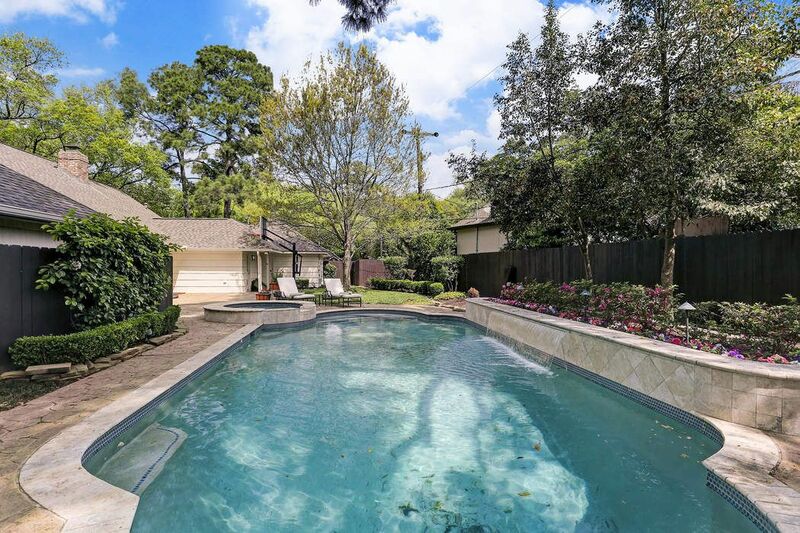 The pool is large enough to swim laps in and has a nice hot tub to relax in after your swim. 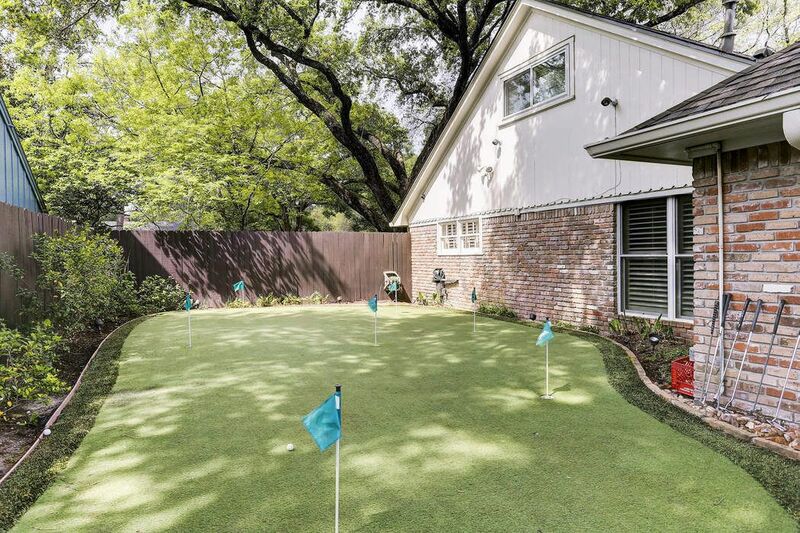 All of your friends will want to come over for some putting! This view of the pool really shows how large it is. This is looking back toward the garage and patio. A great photo of the pool when the azaleas are blooming. 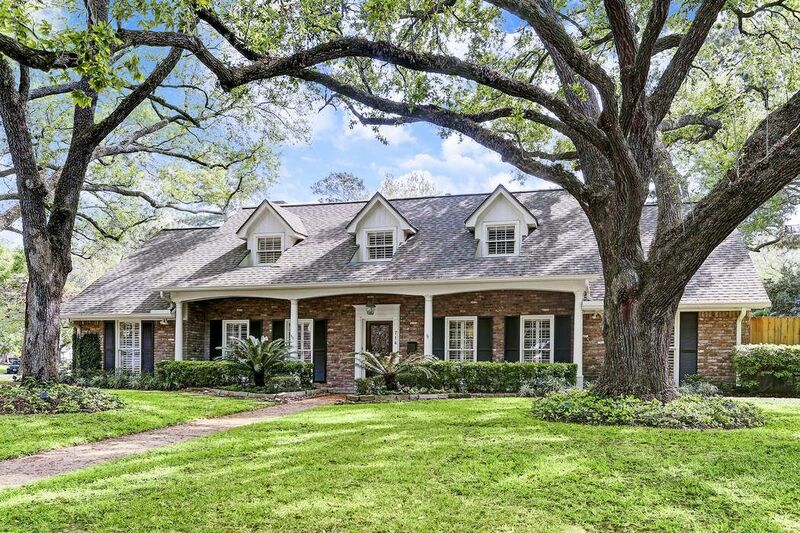 $999,500 5 Bedrooms3 Full Baths3,588 sq. ft.
No Harvey flooding. 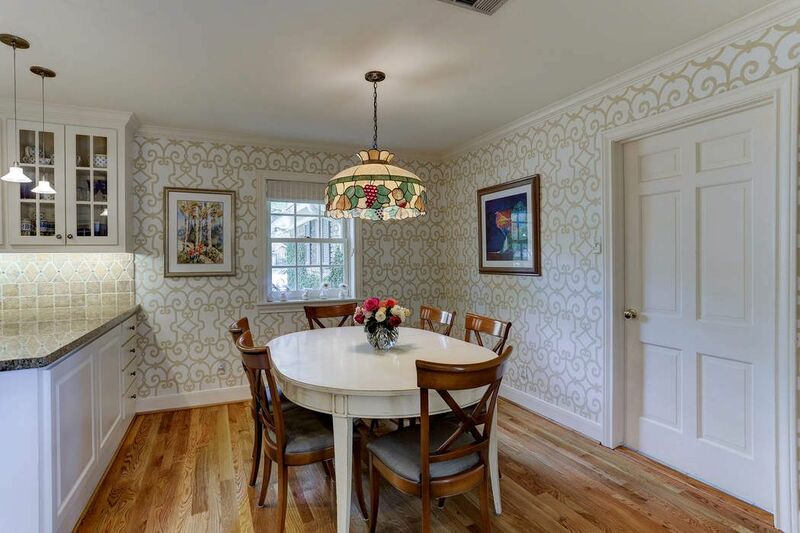 This gracious home has been meticulously maintained and updated over the 26+ years that seller has owned it. 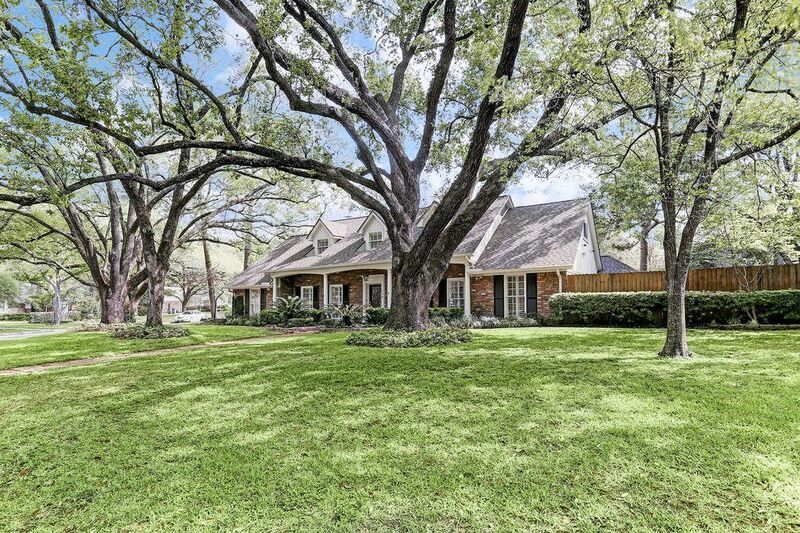 Located in the very desirable neighborhood of Rustling Oaks, it is less than 1 block to acclaimed Rummel Creek Elementary. 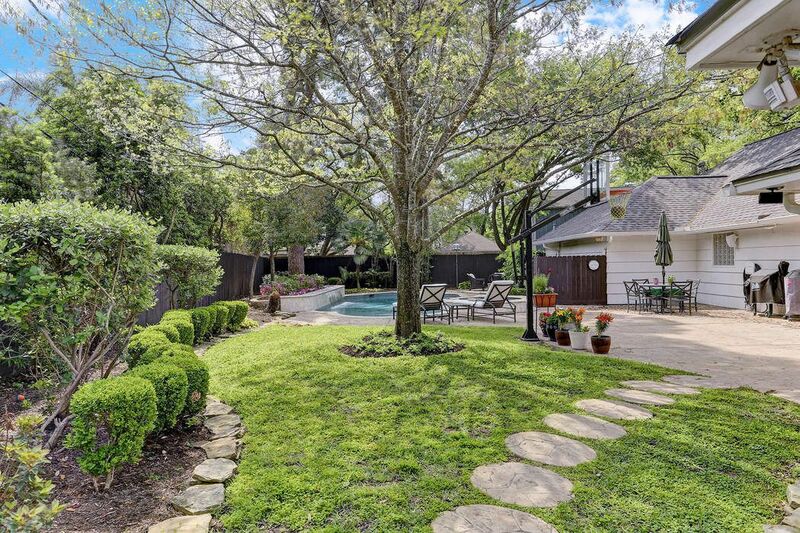 Home is on a large lot with fabulous pool, hot tub, water fall and putting green. Bonus - home has master and 2 bedrooms down. Upstairs is a large game room with built-ins and 2 additional bedrooms. There is storage space galore. A simply beautiful home on a beautiful parcel of land.